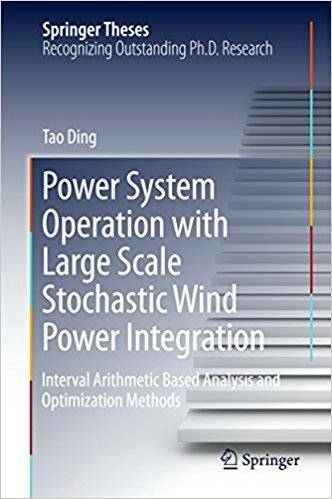 Tao Ding, "Power System Operation with Large Scale Stochastic Wind Power Integration: Interval Arithmetic Based Analysis and Optimization Methods"
This book addresses the uncertainties of wind power modeled as interval numbers and assesses the physical modeling and methods for interval power flow, interval economic dispatch and interval robust economic dispatch. 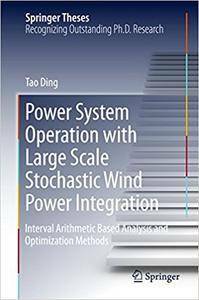 In particular, the optimization models are set up to address these topics and the state-of-the-art methods are employed to efficiently solve the proposed models. Several standard IEEE test systems as well as real-world large-scale Polish power systems have been tested to verify the effectiveness of the proposed models and methods. These methods can be further applied to other research fields that are involved with uncertainty.